Descubra as maravilhas naturais do Parque Nacional Triglav nesta excursão cheia de ação de um dia saindo de Liubliana. Aprecie as vistas do Lago Bled, ande de mota pelos Alpes Julianos, admire as Cachoeiras Kozjak e Boka e desfrute de rafting ao longo do Rio Soča (opcional). My guide was Jaka. He was very kind and gentle. Unfortunately the weather wasn’t good, but I really enjoyed my tour. And also our group was kind people. The nature was soooo awesome, I’ll recommend this tour to my friend. Thanks for my beautiful memories. It was tiring, but loads of fun. Mitja, our tour guide, made us appreciate the park and the country as a whole. His wealth of knowledge about Slovenia is amazing. We appreciated the entire tour more because of him. Marvellous tour except that we reached the end of the day in the dark without being able to explore the last stop. We could not see anything. I advise to pack our lunch. Pick up a lunch box not to waist time and be able to see the last stop. 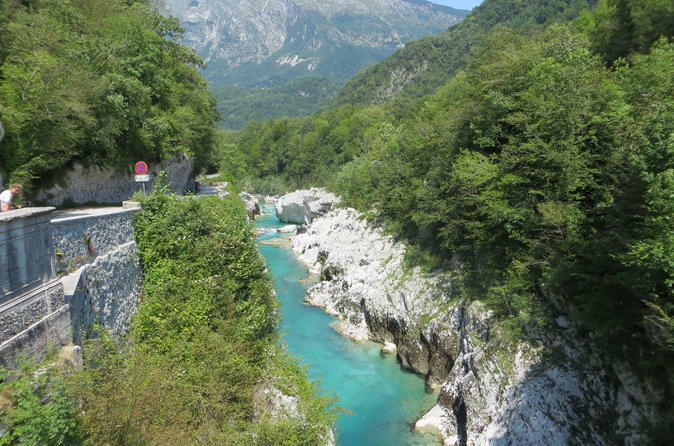 Beautiful area of Slovenia. Very full on day exploring with a lot of tough walking on uneven surfaces and hills. Wish I could give it 10 stars! It was AWESOME!! Alanka was well organised, knowledgable and knew which parts of the tour to do when to account for other tourists, so that I were not lost in the throngs of people at the National Park. She also looked after me at the Soca Spring and that was the most exhilarating experience in my life! Beautiful river, sights and the ride was comfortable and extremely memorable. There is a little bit of walking involved, but you don't have to hike up to the Spring if you don't want to, which is the most treacherous part of the tour. Thank you!! Super Trip from start to finish. I especially felt really proud of myself and alive after managing the short 15 min hike to the source of Soca River. Beautiful experience to drink spring water. Perhaps put a simple diagram of the route on the website. Amazing Day, Its a must for everyone who visit Slovenia. We had some really great views, relaxing and active day at the same time. Alps scenery from the highest point, rivers, lakes, waterfalls and woods had made my day. Thank you Peter. This tour will be unforgettable, i could done it again without any second thought!!! Highly recommend. Fun and enjoyable! I learned a ton!